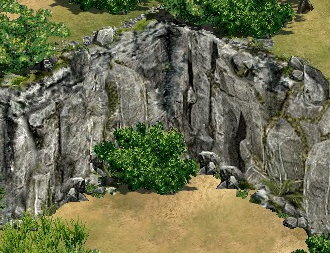 This cliffs are part of a Total conversion that I am making. But I am releasing them now as a request. This contain the .slp files. To use it you can add them on the old version of the game with turtle pack. Or if you are using the HD just copy them on the .slp folder. The New Cliff by Jorgito_aqua27 are part of a larger, conversion mod that he is making, but upon request he released them here separately for us to enjoy. The Mod is designed for the HD edition of AOK but with a bit of work they can be edited for use in the original Conquerors version as well. The Cliffs are beautiful and a really nice change from the AOK cliffs. I really like them, and I have them permanently installed on my HD edition of AOK. I personally do not like the new cliffs that came with the HD edition as they are too small and unrealistic. I find these new cliffs larger and more realistic in size. They are a great substitute for those of you, like me, who do not like the AOK cliffs, or generally want a change of design in their game. The cliffs are an excellent design and of excellent quality. The give a very realistic stony effect which blends in perfectly with the rest of the graphics in AOK. even though they are larger than the AOK:HD cliffs, the anchors are set properly so that no units walk over them or through any of it. I do feel that every time I look at the cliffs, as though they would fit better in a fantasy setting; I don't know if it's just me personally but they just look a bit 'fantasyish' to me. The main downside of this download is the lack of instructions. This was my first mod pack download for my new AOK:HD version and I didn't really know what was different to install the mod pack. Jorgito has included brief instructions of what to do with the SLP files in the description of at the top of the thread, but some more in depth instructions of how to install them in the download itself would be really helpful. Great Cliffs - A Much better version than those that already come with the game.